Farro, said to be the first cultivated grain, originated with the Babylonians in the biblical lands and later found its way to Rome. A highly nutritional grain, it is used to this day in Middle Eastern and Italian cooking. Over the last decades, likely due to greater awareness of global cuisine and more healthful eating, the ancient grain has become more prominent in America. Similar to wheat berries, it has a delightful nutty flavor, an al dente texture when cooked and can be used in an array of recipes from soup to salads to main dishes. Easter pie is an Italian tradition meant to celebrate the end of the Lenten fast with ingredients once forbidden during the season of abstinence. It’s made with eggs, a symbol of life and the Resurrection, and comes in savory and sweet varieties. Savory ones include Italian meats and cheeses in a quiche-style filling all wrapped in pie crust. In sweet Easter pie, the filling includes eggs, ricotta, sugar, dried fruit and sometimes chocolate. 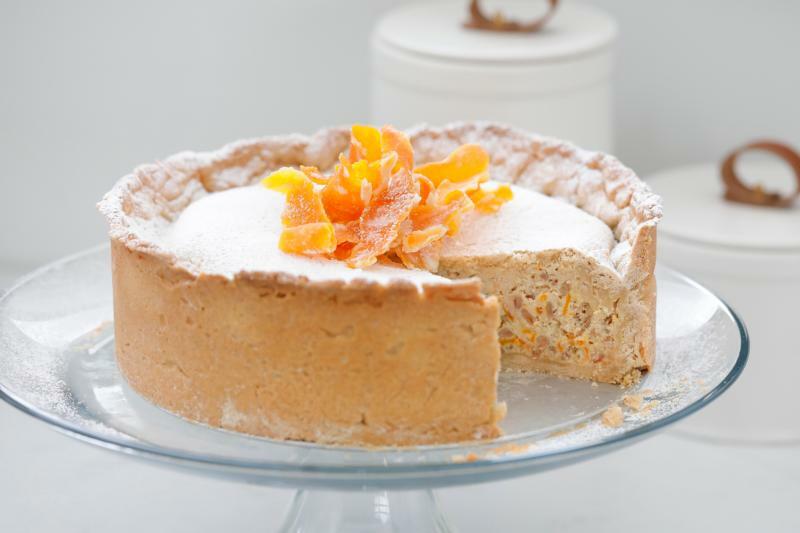 An Easter Pie (“Torta Pasqualina”) recipe from Italian-American chef Franco Lania utilizes farro in a delicious, rich ricotta filling scented with orange and cinnamon. The recipe celebrates the pre-eminent holy day in the Christian calendar and the land where Christianity was born. I adapted Lania’s recipe to simplify it a bit. It’s not all that difficult if you’re familiar with making pie crust. Remember to start the night before with soaking the farro. 1/2 cup farro (soaked overnight): Place the farro in a large bowl, cover with cold water and let soak overnight in the refrigerator. Drain well before using. In a bowl, stir together the flour, cinnamon and salt. In the large bowl of an electric mixer on medium high speed, beat the butter and powdered sugar until fluffy, about 3-4 minutes. Add the egg and yolks gradually, beating until incorporated. Drizzle in the Grand Marnier. Slowly tap in dry ingredients and mix until just blended. Do not overmix. Place dough on a work surface and shape it into a uniform ball. Cut away 1/4 of the dough. Form it into a perfectly round disc. Make a second disc with the larger portion of dough. Wrap each piece in plastic wrap and chill 1 hour. Place the drained farro in a medium saucepan, add the milk, 2 tablespoons of sugar and salt and bring to a simmer over medium heat. Cook, stirring occasionally, for 20 minutes. Drain, discard any remained liquid and place farro in a bowl. Stir the butter and orange zest into the farro. Let cool. In a large bowl, whisk together the ricotta, eggs, sugar, Grand Marnier and cinnamon. Beat until blended. Stir in the farro mixture and candied orange peel. Grease and flour a 9-inch springform pan. Roll out the larger piece of dough to a 16-inch circle. Drape the dough over the rolling pin and fit the dough into the pan. Using your fingers, carefully press the dough into the bottom and sides of the pan, leaving excess dough over the edge. Press together any tears. Roll out the smaller piece of dough to a 10-inch circle. Drape the dough over the rolling pin and gently place the dough over the top of the pie. Trim the dough leaving 1/2 inch of excess all around the rim. Fold the edge of the dough over to form a bit of a crown and pinch dough firmly to seal. Bake in preheated oven for 1 hour or until it is golden brown on top and a toothpick inserted in the center comes out clean. Let the pie cool in the pan on a rack 25 minutes. Remove the ring of the pan and let the pie cool completely on a wire rack. Pie can be stored covered in the refrigerator for up to two days. Bring to room temperature before serving. Just before serving, dust the pie with confectioner’s sugar and, if desired, garnish with candied orange peel. Recipe adapted from Franco Lania’s website www.francolania.com. NEXT: Let us rejoice and be glad!